This famous surrealist painting by Octavio Ocampo has been an interesting topic of discussion among art enthusiasts, as it tends to show different things to different people. The painting is so abstract and complex that its purpose is not to convey a particular meaning, but rather intends for the viewer to give it a meaning. The painting “Forever Always” by surrealist Octavio Ocampo is a renowned painting that is centered on perception through illusion. 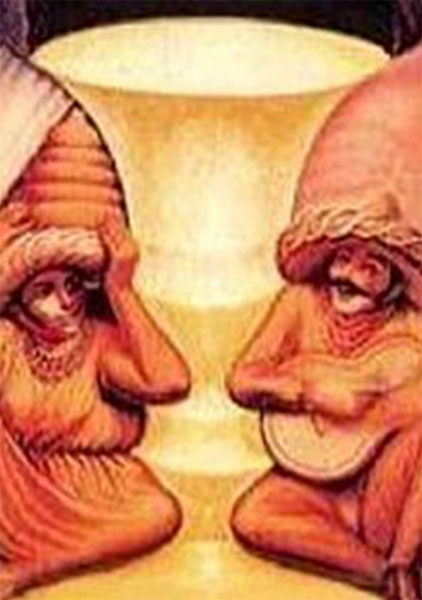 From afar and at a glance, the illustration seems to depict an old woman and man looking at each other. When observed a little closer however, it seems to be a different painting entirely. Rather than an old couple, there is a young man playing guitar and a young woman sitting opposite him. Further yet, there is also a golden goblet in the middle. 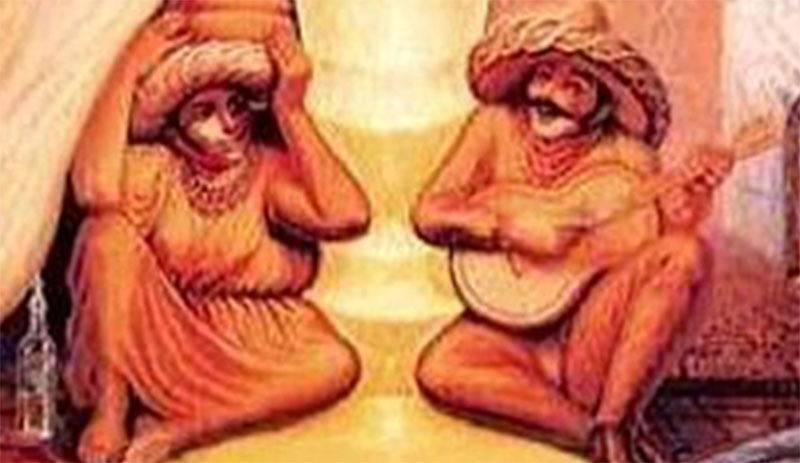 This painting is cleverly designed to engage your perceptions. If you first saw the goblet when looking at the picture, your creativity is focused on personal growth, spiritual growth, and redemption. You value self-awareness, and have found how being conscious of your thoughts and feelings allows them to open, helping you to become more at peace and more free. Goblets have long been symbols for redemption and a golden goblet represents taking in the pure light energy you need to heal certain parts your life. Consider taking some time to spend immersed in the beauty of nature in the near future. The serene and refreshing energy of nature may be just what you need to help your mind become calm, and to allow the deep creativity you have within your heart to come into full bloom. Personal growth is not always about fixing things, but often is about allowing our hearts and feelings to fully express themselves without judgment. Acceptance is a wonderful practice that allows the mind to fully embrace all of our feelings, and frees up the energy that was once used in resisting emotions we may have had difficulty with in the past. If the musicians were the first image you saw, you are quite the creative person as this is the object least seen at first glance. Your attention to detail is impressive, and likely is connected to your ability to see the good within any situation, as well as the beauty within any setting. Your Joy and inspiring creativity is linked to your strength in gratitude. You’re able to be grateful for the little things in life, and you spend your time counting your blessings rather than counting your problems. The most intriguing aspect of your creative mind to be revealed is that you may not yet be aware of what a profound and positive effect you are able to have on others. If through your many wonderful ideas, you’re able to help another person to see the light of gratitude, and to learn how to appreciate the little things in life that are so wonderful, you have helped to steer this person towards a lifetime of joy and happiness. While this may seem like an easy thing for you, it’s not for most people. Seek out new ways you can inspire others by inspiring them to practice gratitude and be grateful for the blessings they already have, and you may raise up other inspiring people that will help to brighten the world with you. 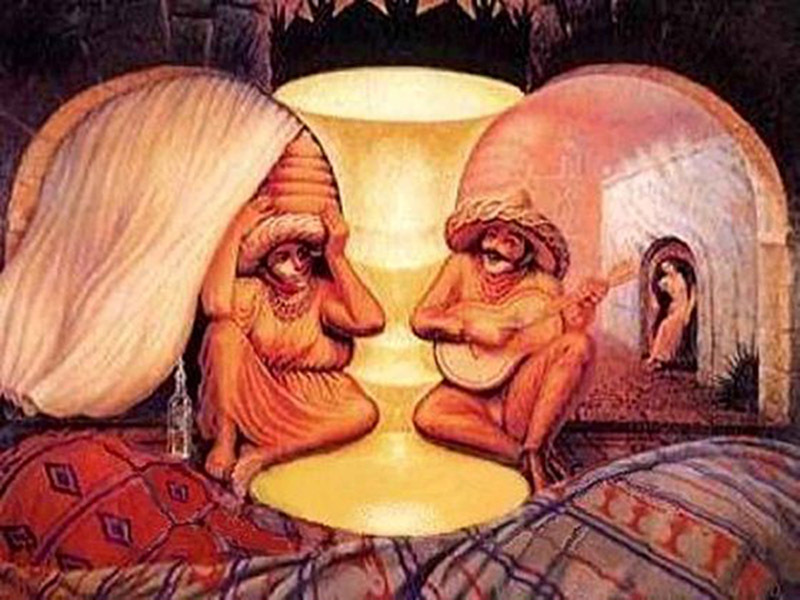 If you first saw the old couple in this beautiful painting, you have a deeply realistic view of life and your mind is centered in the truth. You’re able to see the big picture in life, and often know exactly what you want and where you’re going, whether it’s your career or a serious relationship. When it comes to romance, you’ve figured out what it takes to have a happy and successful relationship. You’ve found a quiet calm within that allows you to get through troubles, and you’re able to maintain a general attitude of happiness most of the time. The key to be revealed in terms of creativity for those who first see the old couple has to do with a deep and honest focus on the heart. While you’ve figured out much of life, your true creativity and passion springs forth from a place of deep love within. You truly and deeply value the ones you love in your life, and by staying within your heart, you become full of love. This practice of self-compassion allows you to fill your cup full of love, and then overflow to shower love on those around you, often guiding them and caring for them when they need love the most. Your sharp mind can be filled with some truly great ideas by learning to let go a little bit, and letting the openness and softness of your heart come up and fill your mind with loving ideas. 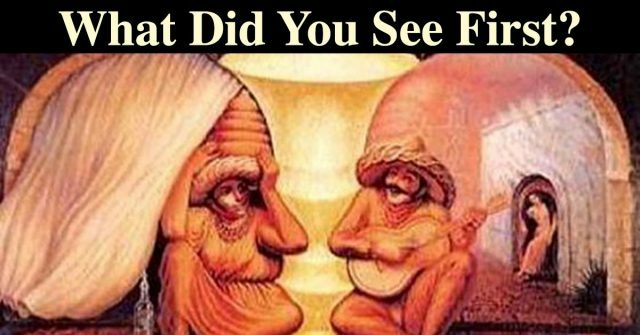 What did you see first in the picture? Your eyes are beautiful, and you are loved.